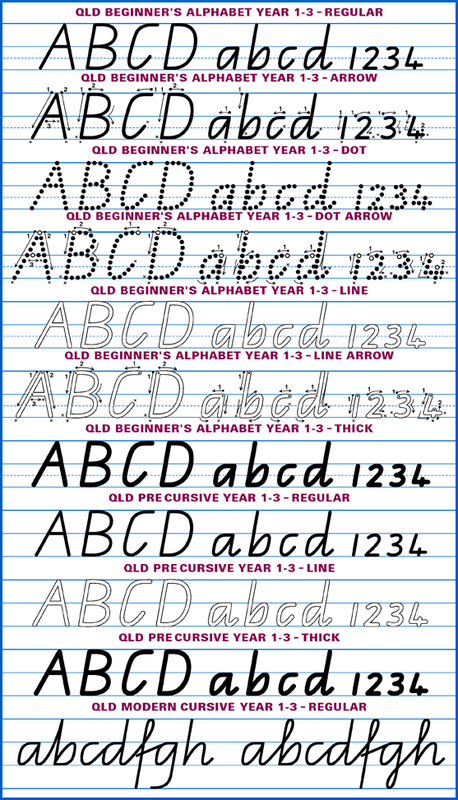 11 OpenType fonts - QLD Beginner Yr 1-3 (Regular, Arrow, Dot, Dot Arrow, Line, Line Arrow, Thick), QLD PreCursive Yr 1-3 (Regular, Thick, Line) and QLD Cursive (QCursive). 26-page Beginner Manual, 11-page Beginner Alphabet Templates and 35-page Cursive Manual (PDFs). 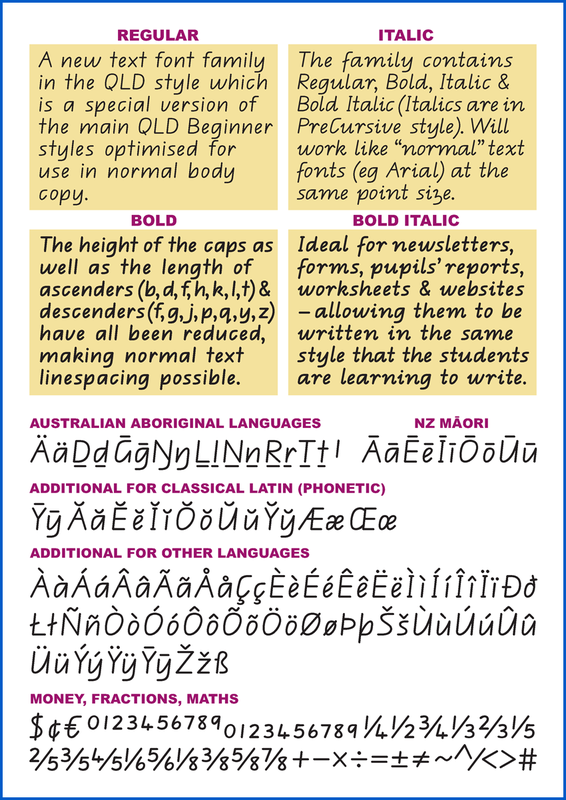 The Regular and Thick Beginner Yr 1-3 fonts have extended language support (including Australian Aboriginal GT and Phonetic Latin GT software keyboards for Mac & Windows) and expanded maths support (including automatic fractions). Can be set to display with or without horizontal guidelines. Delivered by download. 10-computer licence. Win/Mac compatible. 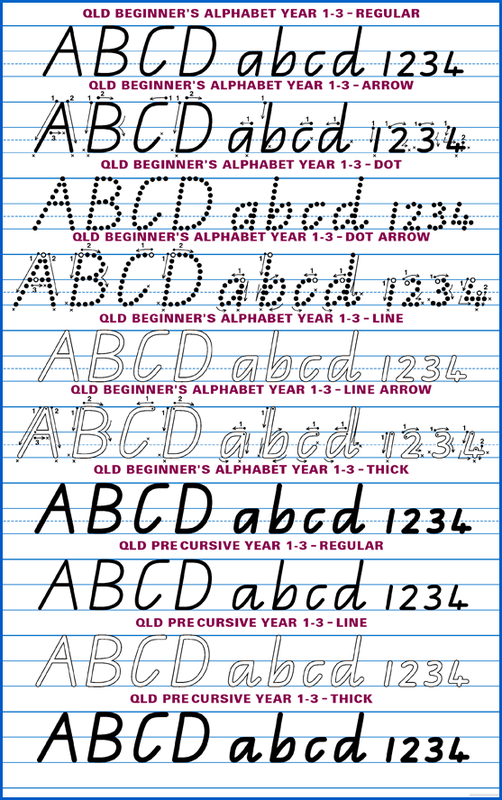 10 OpenType fonts - QLD Beginner Yr 1-3 (Regular, Arrow, Dot, Dot Arrow, Line, Line Arrow, Thick) and QLD PreCursive Yr 1-3 (Regular, Thick, Line) plus 26-page Beginner Manual and 11-page Beginner Alphabet Templates (PDFs). The Regular and Thick Beginner Yr 1-3 fonts have extended language support (including Australian Aboriginal GT and Phonetic Latin GT software keyboards for Mac & Windows) and expanded maths support (including automatic fractions). Can be set to display with or without horizontal guidelines. Delivered by download. 10-computer licence. Win/Mac compatible. 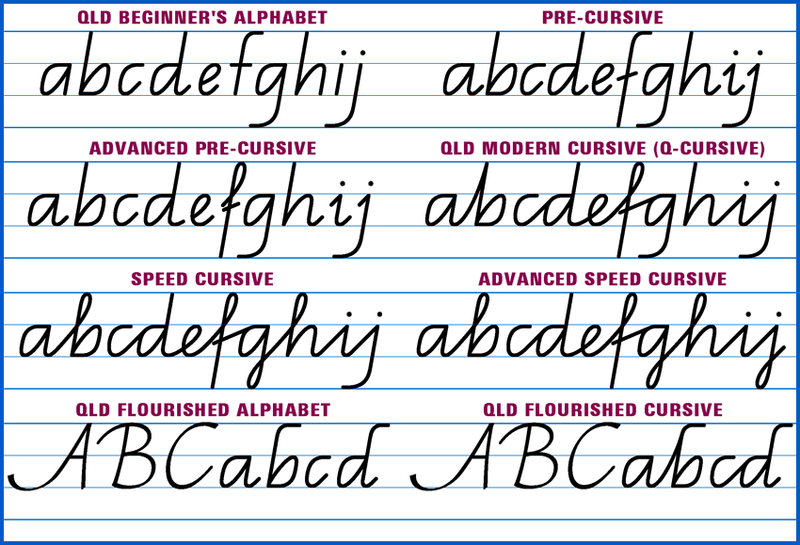 1 OpenType font plus 35-page Cursive Manual (PDF). 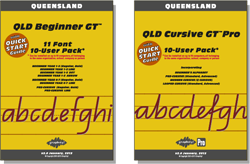 An omnibus font combining QLD Beginner Yr 1-3, PreCursive Yr 1-3, QLD Modern Cursive (QCursive), Speed Cursive, QLD Flourished Alphabet and QLD Flourished Cursive all in the one font. All joining levels and lettershape variants in the QLD syllabus can be selected. Slightly lighter weight than the Beginner Pack fonts. Note that there are no Dotted, Outlined, Arrow or Thick fonts in this pack. Can be set to display with or without horizontal guidelines. Delivered by download. 10-computer licence. Win/Mac compatible. 4-font OpenType family (Regular, Italic, Bold, Bold Italic) in the QLD style, optimised for use in text with normal linespacing. Multi-Language support - contains all special characters required for Australian Aboriginal, NZ Maori, Classical Latin (Phonetic) and many other commonly-taught languages which use the latin alphabet. Enhanced Maths support - including the ability to type "true" fractions automatically. Includes special custom Keyboard Layout software (Mac & Windows) for use with Australian Aboriginal and Phonetic Latin. Numbers are capital-height by default. Not available as individual fonts. Horizontal guidelines not included. Not intended or recommended for use in the actual teaching of handwriting in the initial & early stages. Delivered by download. 10-computer licence. Win/Mac compatible. 4-font OpenType family (2D Outline, 2D Solid, 3D Outline, 3D Solid) plus 11-page User Guide (PDF). The 2D fonts contain 86 standard two-dimensional geometric shapes (circles, foils, polygons, arrows, crosses, polygrams, stars etc etc). 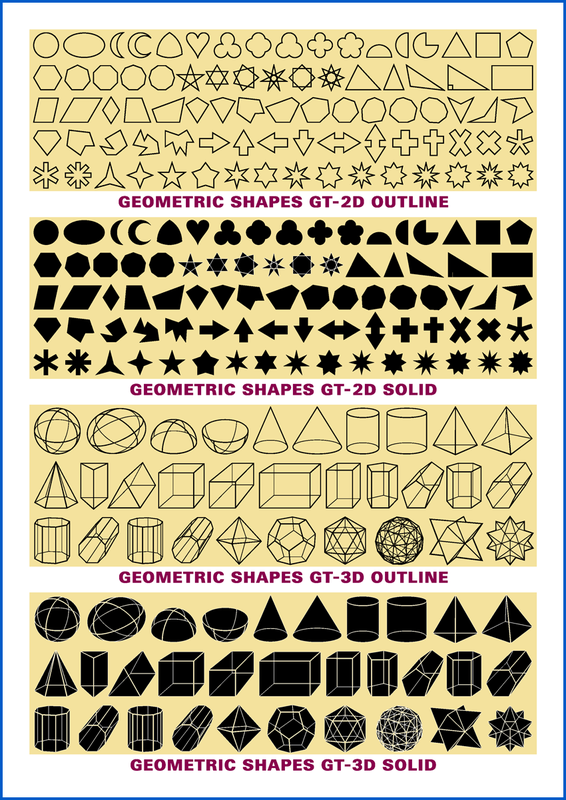 The 3D fonts contain 33 standard three-dimensional shapes (spheroids, cylinders, cones, pyramids, prisms, platonic solids, regular & stellated polyhedra etc etc). Not available as individual fonts. Horizontal guidelines not included. Suitable for all States and regions. Delivered by download. 10-computer licence. Win/Mac compatible. All the fonts from the Beginner Pack above may be purchased individually below along with some additional fonts not included in the Beginner Pack. If you need six or more Beginner Pack fonts below, buying the whole Beginner Pack is better value. 1 OpenType font plus 26-page Beginner Manual (PDF). With extended language support (including Australian Aboriginal GT and Phonetic Latin GT software keyboards for Mac & Windows) and expanded maths support (including automatic fractions). Can be set to display with or without horizontal guidelines. Delivered by download. 10-computer licence. Win/Mac compatible. 1 OpenType font plus 26-page Beginner Manual (PDF). Can be set to display with or without horizontal guidelines. Delivered by download. 10-computer licence. Win/Mac compatible. 1 OpenType font plus 26-page Beginner Manual (PDF). With extended language support (including Australian Aboriginal GT and Phonetic Latin GT software keyboards for Mac & Windows) and expanded maths support (including automatic fractions).Can be set to display with or without horizontal guidelines. Delivered by download. 10-computer licence. Win/Mac compatible. An optical media backup disc (write protected) of the fonts purchased in this Order, mailed to you within 3-5 days (price includes postage). You'lll still be able to download your fonts at the time of your Order and start using them immediately. The disc is Win/Mac compatible.DVD+R. A USB Flash drive backup (write-protected) of the fonts purchased in this Order, mailed to you within 3-5 days (price includes postage). You'lll still be able to download your fonts at the time of your Order and start using them immediately. 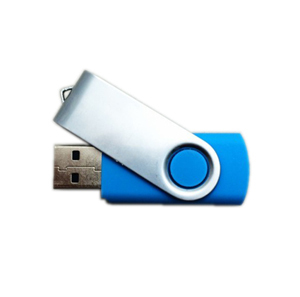 The USB flash drive is Win/Mac compatible (NTFS format) and can be used in USB v1.0, 2.0 and 3.0 ports. 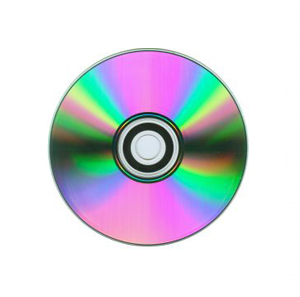 Recommendedl if your computer/device doesn't have a DVD drive.